About Us - Carload Express, Inc.
Carload Express, Inc. operates four shortline railroads: The Allegheny Valley Railroad (AVR) and Southwest Pennsylvania Railroad (SWP) serving western Pennsylvania, Delmarva Central Railroad (DCR) serving Delaware, Maryland, and Virginia on the Delmarva Peninsula, and the Ohio Terminal Railway (OHIO) serving the Ohio River Valley bordering Ohio and West Virginia. Our dedicated, locally based management is able to offer timely and flexible service demanded by today’s fast paced supply chains while offering the inherent economies of scale that rail shipping provides. Our multiple connections to the North American rail system allow our customers to enjoy competitive freight routing options, lowering their overall shipping costs. Carload Express, Inc. plays an important role in the communities we serve by transporting many of the basic goods used in everyday life such as the paper you read, the food you eat, the bricks, steel, and lumber to build your home, and the coal that supplies the power to light it. The nearly 90,000 shipments we handle annually equate to roughly 360,000 fewer trucks on local highways each year, lowering congestion and road maintenance costs. Rail Pricing and Logistics Planning – Need to figure out how much it will cost to transport your product cross country and then warehouse your inventory close to the final destination? Let us do the legwork for you! Warehousing – Our warehouse network has the right facility at the right location to fit your needs for almost any possible commodity. Transloading – Combine the power of rail economics with the flexibility of truck delivery. Customer Sidetrack Engineering – Our experienced engineering staff will assist with designing sidetrack access to your facility and can even help with obtaining grants from the Pennsylvania Department of Transportation’s Rail Freight Assistance Program to help fund your track construction. 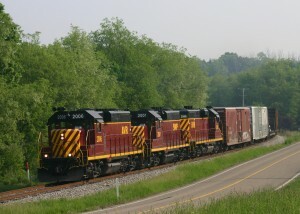 2012 and previous winner (2008 and 2011) of the American Shortline and Regional Railroad Association Jake Jacobson Safety Award (with Distinction). Recognized as by Norfolk Southern Corp, as “Shortline Railroad of the Year” for 2013. Multiple time award-winner of Norfolk Southern Marketing and Business Development Awards, receiving four such awards in 2015, and four more in 2016. 2010 Recipient of CSX Transportation Regional Development Partnershipping Award.